I had been wanting to visit Bangkok Art & Culture Center and found it a very very interesting place. Located conveniently and easily accessed from National Stadium BTS Station, Bangkok. We arrived at this wonderfully designed, modern, art gallery that also combines with cafe, shops, and seats for just plain discussion for art, politics, or you name it. Some of the cafes we encountered is this particular one named Tea. 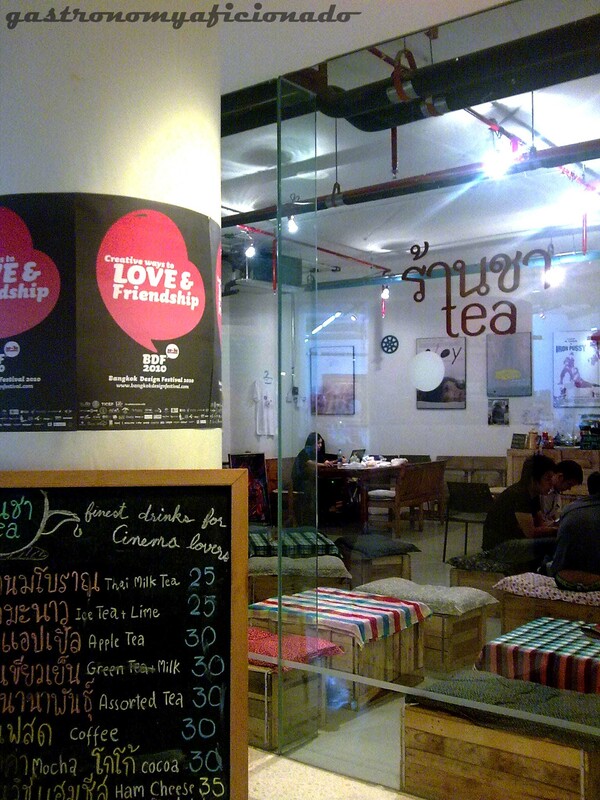 Yes, just plain Tea or in Thai, ใบชา if I’m not mistaken with the writing. The design was simple but homey for teens or young adults like us. Mostly it serves only beverages and snacks up to sandwich. Fatigues and ‘heat strike’ from our previous whole day trip across Chao Phraya River, Wat Po, and Grand Palace made me decide that having a good, solid hot Thai Milk Tea (THB 25) would be a good idea. The waitress served us indeed a good tea. In one glass, she served the already mixed Thai tea with milk. In addition she also added a glass of plain tea in case the already mixed one is too sweet or not to your liking. It was a nice afternoon of us talking about our honeymoon trip so far, our next plans, and just simply enjoying the moment while sipping the good tea. The other patrons there were a group of, we assumed, college students. They were having this interesting conversation, we assumed again, must be something about art and daily life in Thai. Apart from the cafe, the atmosphere and everything that BACC has to offer for us were also delighting our afternoon. In the end when the bills came, I noticed that the waitress was wearing a t-shirt with the writings about JIFFEST 2009. It’s the Jakarta’s own independent film festival. Hell.. She’s a Thai and she got that t-shirt! I figured that Bangkok must have interesting events as well in this fine city! Next time, I’d be sure to visit this place again. Pathumwan Intersection, facing MBK and Siam Discovery Center. The 3rd floor entrance is connected to National Stadium BTS Station. Tea is located on the 4th floor. 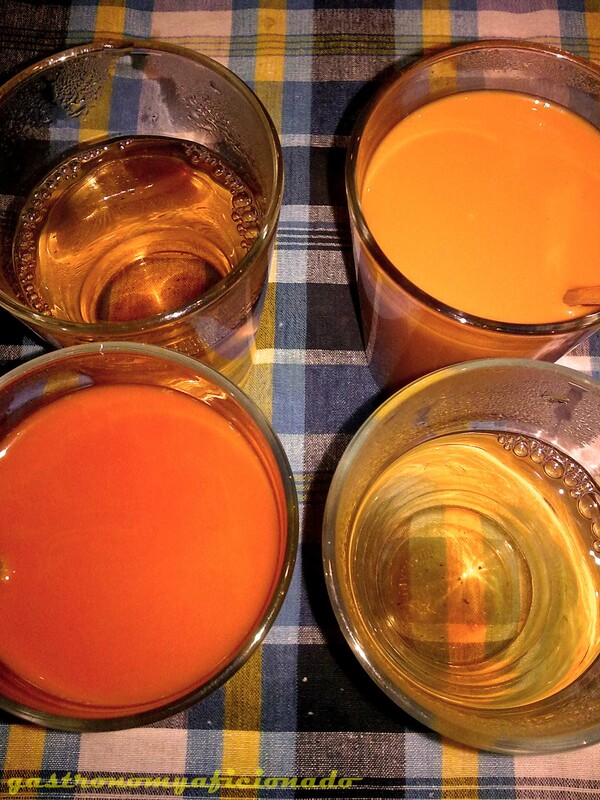 what is the speciall flavour of Thai tea? that make it different frm others? Well I guess there’s not much difference with the rest. The best one would be from 7 Eleven in Thailand but perhaps it’s because we had a tiring day that day and we found BACC an interesting place and next, Tea seemed to be the right choice for the afternoon tea! Subjective we may, but with the right price, the right place, and a good mixture between the tea and the milk made us happy that day.